When it comes time to cook PEI Mussels, follow these simple instructions to serve up delicious classically-steamed mussels. Here's a simple how-to for steamed PEI Mussels. 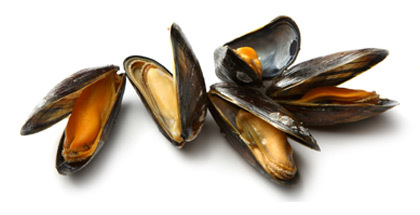 Rinse and stir mussels under cold running fresh water. Mussels naturally open and close their shells when out of water. For any mussels that do not close after rinsing, tap their shells or lightly squeeze them while running under the water again. For any mussel that still does not close, throw it away. Place enough liquid in an empty pot to cover the bottom. Turn on the element to high. Add the mussels to the pot and cover with the lid. Keep temperature to high. Cooking will take 5 to 7 minutes depending on the strength of heat, how much liquid you use, and the amount of mussels. When the steam is pouring out from under the lid of the pot for 15 seconds, they are done! Let rest 1 minute and then tip the contents into a bowl and serve with some fresh crusty bread for dipping in the wonderful broth– it's that simple! HOW MANY MUSSELS TO COOK PER PERSON? Knowing the proper proportions of mussels to the number of guests you have will ensure a successful event. We suggest 1 to 1¼ pounds per person for a main course or ½ pound per person for an appetizer. Rinse before steaming, discard any that don't close. 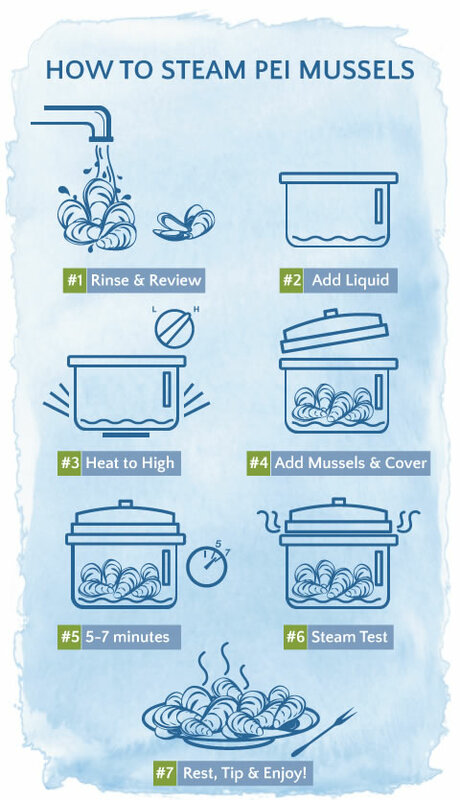 Steam your mussels with a small amount of liquid in a pot with a lid. Mussels are done when the steam comes out from under the lid and the mussels are open. Don't forget the broth, it makes a tasty dip for bread. In place of water, you can also use wine or beer or other liquids to steam the mussels and add some unique flavour. Throw in some chopped garlic or onions to add more flavour. It's best if the pot heats up very quickly so use maximum heat. This allows the mussel meat to release better so it's easily removed from the shell. Be careful not to overcook mussels and definitely do not boil them covered in water like a potato or pasta as they will not open. Mussels need to steam not boil.